I have sold a property at 302 202 24TH AVE E in Vancouver. Bluetree on Main. Perfect Main Street location , steps to shopping, grocery markets & vibrant restaurant scene. Easy access to transportation & Hillcrest Community Centre . This 2 bedroom, 2 bath home offers excellent bright open plan. Fantastic kitchen with centre island featuring stone counters, top end Frigidaire Gallery stainless steel appliances, including a gas range, glass tile backsplash, contemporary cabinets, undermount sink & under cabinet lighting. Beautiful bathrooms include in floor radiant heat, large rain head showers & custom cabinets. Huge balcony on quiet lane side offers great city/mountain VIEWS! 2/5/10 Travelers New Home Warranty. 2 secured parking spaces. In suite storage + large locker, bike storage & pet friendly with dog wash. You want to live here! I have sold a property at 2063 37TH AVE W in Vancouver. Beautiful 1912 Craftsman Home. Sit on your front porch and enjoy the setting sun. Well maintained by long term owners this is a large house with lots of details like high coffered ceilings and a period fireplace. Upstairs is ready to berenovated as a master suite. The main floor has large formal living and dining rooms. There are two bedrooms and a den which could be a third bedroom. Big kitchen and a great deck. Downstairs is a two bedroom suite, another bedroom and unfinished workshop and laundry. Big yard with lots of mature landscaping perfect for gardeners and a nice street. An Easy walk to shopping schools and all the convenience of Kerrisdale. Centrally located to UBC, Downtown and the Airport. YOU'LL LOVE IT! Please visit our Open House at 3565 15TH AVE W in Vancouver. VIEW! VIEW! VIEW! Simply stunning views of the water, mountains and downtown city skyline from this wonderful property. This is a solid three bedroom and two bath on the main bungalow with a high ceiling two bedroom basement suite.The house was built in 1958 and has been very well maintained by long term owners. Live in, add a level up or build your new dream home on this prestigious RS-5 lot. The master bedroom has a two piece ensuite, there are real hardwood floors, two gas fireplaces, a big private deck, a two car garage and close to the best public and private schools. Easy access to UBC, Downtown and the Airport. Shopping along 10th Avenue, Restaurants galore and the Beach just minutes away. YOU'LL LOVE IT! I have sold a property at 3697 15TH AVE W in Vancouver. I have sold a property at 4879 QUEBEC ST in Vancouver. Centrally located and just minutes to Riley Park Community Center, a multitude of eclectic shops, Bistros and Nestors Market along Main Street, public transportation, Little Mountain Golf pitch and putt, Brock Elementary School and Eric Hamber Secondary. Hold or build your dream home with Laneway House on this 47.74 x 117 ft lot. Buyer to do their due diligence with the City of Vancouver with regards to measurements, lot size and zoning. 1st showing at Open House Sunday March 8th 2015 1-4 PM . I have listed a new property at 3565 15TH AVE W in Vancouver. I have listed a new property at 2063 37TH AVE W in Vancouver. VANCOUVER, B.C. 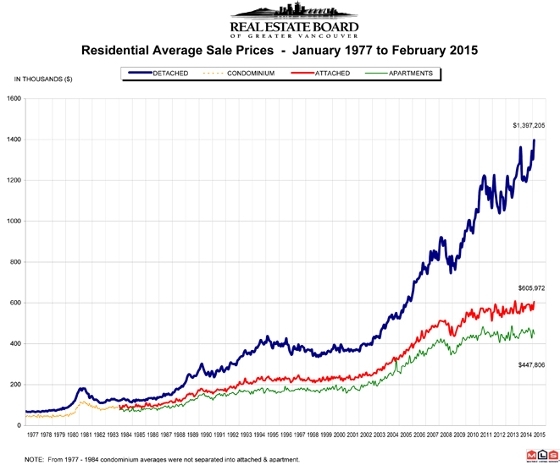 – March 3, 2015 – Conditions within the Metro Vancouver* housing market continued to strengthen in February as home sale and listing totals came in well above the region’s ten-year average for the month. The Real Estate Board of Greater Vancouver (REBGV) reports that residential property sales in Greater Vancouver reached 3,061 on the Multiple Listing Service® (MLS®) in February 2015. This represents a 21 percent increase compared to the 2,530 sales recorded in February 2014, and a 60 percent increase compared to the 1,913 sales in January 2015. Last month’s sales were 20.2 percent above the 10-year sales average for the month. New listings for detached, attached and apartment properties in Metro Vancouver totalled 5,425 in February. This represents a 15.4 percent increase compared to the 4,700 new listings reported in February 2014. Last month’s new listing count was 11.8 percent higher than the region’s 10-year new listing average for the month. The total number of properties currently listed for sale on the REBGV MLS® is 11,898, an 11.3 percent decline compared to February 2014 and a 10.1 percent increase compared to January 2015. The MLS® Home Price Index composite benchmark price for all residential properties in Metro Vancouver is currently $649,700. This represents a 6.4 percent increase compared to February 2014. The sales-to-active-listings ratio in February was 25.7 percent. This is the highest that this ratio has been in Metro Vancouver since March 2011. Sales of detached properties in February 2015 reached 1,296, an increase of 25.6 percent from the 1,032 detached sales recorded in February 2014, and an 84.1 percent increase from the 704 units sold in February 2013. The benchmark price for a detached property in Metro Vancouver increased 9.7 percent from February 2014 to $1,026,300. Sales of apartment properties reached 1,244 in February 2015, an increase of 20.5 percent compared to the 1,032 sales in February 2014, and an increase of 63.7 percent compared to the760 sales in February 2013. The benchmark price of an apartment property increased 3 percent from February 2014 to $386,500. Attached property sales in February 2015 totalled 521, an increase of 11.8 percent compared to the 466 sales in February 2014, and a 56.5 percent increase from the 333 attached properties sold in February 2013. The benchmark price of an attached unit increased 4.6 percent between February 2014 and 2015 to $481,500.